New Zealand coach Steve Hansen has repeated his call for the country's government to look at helping fund the team in order to retain its top-level players amid claims the lure of the All Blacks' jersey had waned. Hansen made his initial call last month when Prime Minister Jacinda Ardern and Sports Minister Grant Robertson visited the team after their 40-12 victory over the Wallabies at Eden Park. 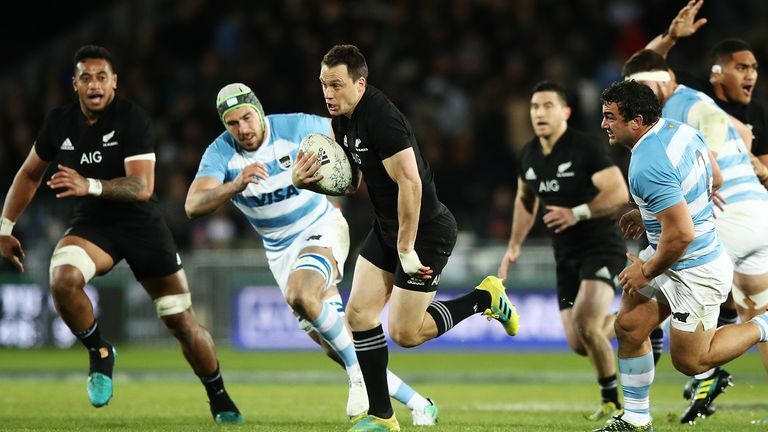 "This is my opinion, but I believe the All Blacks, over many years, have been a great brand for New Zealand," Hansen told reporters on Thursday ahead of the Rugby Championship clash against South Africa - live on Sky Sports. "You can go anywhere in the world and people may not know New Zealand, but they've heard of the All Blacks, and I think it's an opportunity to take New Zealand to the rest of the world by using that brand. "That's why I mentioned they should be one of our sponsors." Ardern said last month she could not see the organisation receive any further government funding than it already did and if it did, she would prefer it went to the community side of the game rather than subsidising professional salaries, something Hansen agreed with on Thursday. "If the money goes to grassroots and developing women's rugby and developing young players to come through and become All Blacks, then maybe some of the money we get from ... our sponsors can be used to keep players here," Hansen said. His statement follows a warning from fly-half Lima Sopoaga, who told the Guardian this week the All Blacks jersey had lost its allure and he suspected more players would leave for lucrative contracts in Europe at an earlier age. Only players contracted to New Zealand Rugby and playing at home are eligible to be selected by the All Blacks, a policy the organisation sees as crucial to keeping its top players at home. Several players, like Charles Piutau and Steven Luatua have all departed for European clubs while arguably still in their prime and Sopoaga, who played 16 tests for the All Blacks, said he thought more would follow. "They realise that it's a business these days, and it can be pretty cut-throat at times," said Sopoaga, who left for English club Wasps after the Super Rugby season. "For a lot of guys like myself, who come from big families, from low socio-economic backgrounds the chance to change your family's life is pretty overwhelming. "It's not something you should take lightly and sometimes the jersey is not enough for a better life. It is special, the experiences you have are pretty surreal, but down the track those things don't pay for a roof over your head."